In all, there are 31 issues. This includes two 1873 each of the 1873-P and 1873-S, as both years employ an Open 3 and a Closed 3 logotype. Until a few years ago, this type was actively promoted by a large marketing firm and this created considerable demand. When this promotion ended, this type languished; except for the Carson City issues which remain as popular as ever. I feel that this is currently an overlooked series. Some dates are clearly undervalued and a contrarian will discover reasonably good availability on higher quality examples of many of the tougher dates. Let’s explore some of the ways to collect Type Two double eagles, from basic to intense. As I mentioned above, there are 31 issues that constitute a full set of Type Two double eagles. There is one very rare and expensive issue (the 1870-CC) which is going to be a stumbling block for all but the deeper-pocketed collectors. The second rarest issue is the 1871-CC which has become hard to locate and pricey in recent years. All of the other issues are available in the AU50 to MS62 range for less than $10,000. Nearly all the pre-1873 Philadelphia and San Francisco issues share the same rarity profile. These are available in grades through AU55, scarce in properly graded AU58, rare in the lower Uncirculated grades, and very rare in MS62 and above. The scarcest Philadelphia date is the 1868 and this is followed by the 1870, 1871, and 1869. Any of these dates can be located for $5,000 and lower. If a collector can afford to spend $10,000 per coin, he will be able to complete the dozen coin P mint date run in Uncirculated. None of the twelve San Francisco dates are scarce but two (1866-S Motto and 1867-S) are very scarce in properly graded AU58, and quite rare in any Uncirculated grade. The other 10 dates are only moderately scarce in the higher circulated to lower Uncirculated grades. The seven Carson City issues range from common to very rare. Most collectors skip the 1870-CC and focus on the remaining six dates. The 1871-CC is going to be very hard to locate for less than $40,000 to $50,000, and a really nice AU example might run closer to $60,000-70,000, if you can find one. I haven’t seen a really nice one in a number of years and I’d advise you to act quickly if you see the right coin. The 1870-CC deserves some attention as well. This issue was recognized as a rarity many years ago but it really came into its own in the early 2000’s. In June 2000, a PCGS EF45 sold for $120,750 in a Goldberg sale. By September 2008, the same firm sold another PCGS EF45 for $345,000. After the 2008-2009 Financial Crisis, this date/grade dropped down to a $225,000 valuation, but the last PCGS EF45 to sell at auction brought $300,000 in January 2018. I have only seen three or four 1870-CC double eagles which I thought were nice coins and the best I’ve handled was a PCGS AU53 which I sold into a Nevada collection around 15 years ago. My advice regarding this date is to be patient and to be aggressive if and when the “right” coin comes up. If the 1870-CC isn’t included, a nice set of EF/AU Type Two double eagles should cost in the area of $175,000-200,000, with around one-quarter to one-third of this budgeted on the 1871-CC. A nicer set consisting of AU and Uncirculated pieces would require $275,000-300,000. Upwards of $500,000 could easily be spent on a world-class collection of mostly Uncirculated Type Two double eagles. 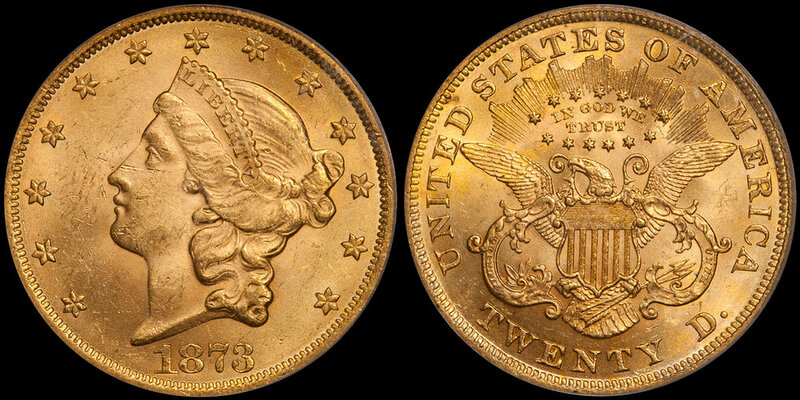 A year set of Type Two double eagles would consist of one coin per year from 1866 through 1876. This would be a total of 11 coins. The appeal of this set is that it allows the collector of average means to skip the expensive 1870-CC and 1871-CC issues and to substitute them with more affordable Philadelphia or San Francisco issues. If the collector decides to attempt such a set, he should make sure to include at least one or two Carson City coins. The most logical are the 1875-CC and the 1876-CC; both can be obtained in nice AU grades for around $5,000 per coin. A very presentable set with the coins in EF and lower AU grades could be assembled for around $25,000. A set with every coin in nice AU grades could be assembled for around $50,000. An Uncirculated set would cost at least $75,000 and if the coins grade at least MS62 to MS63, the cost would be into six figures. We’ve touched on the general parameters of the three mints above. Another way to dabble in the Type Two market is to assemble a three-coin set which contains one example of each mint which struck this design. Most collectors who seek a Philadelphia Type Two for a three-coin mint set are likely to purchase a comparatively high-grade common date (1873-1876). Prices for MS62 and MS63 common P mints have dropped to temptingly low levels and these seem like good values to me if the coins are properly graded. A San Francisco issue for this set is also likely to be dated from 1873 to 1876 as these four years are much more available in higher grades than the 1866-1872 issues. For both the P and S mint coins, $2,500-5,000 will buy a really impressive piece. The Carson City issues are scarcer and very popular. For type purposes, the 1875-CC and 1876-CC are the likely choice. An interesting alternative would be a scarcer date such as an 1872-CC or an 1873-CC in mid-range AU. I mentioned above that price levels for higher grade common date Type Two $20 Libs are at their lowest point in many years. This is the result of supply increases, reduced demand, gradeflation and other factors. As someone who has bought millions of dollars’ worth of Type Two double eagles, here are a few buying tips I’d like to share. Most Type Two issues are weakly-struck on Liberty’s hair. Learn how to distinguish between strike and wear or you will be clueless when it comes to grading these. Nearly all issues dated between 1866 and 1872 are very rare in MS62 and higher grades. For most buyers, nice AU55 and AU58 coins represent the best value grade. Thousands of Type Two coins have come out of Europe and other overseas banks. These coins are easily distinguishable by their dirty gold “Euro” appearance. I like this look but your enthusiasm may vary. As a rule, this type is nearly always found with extensive surface abrasions or bagmarks. If you are patient, you should be able to find coins which are cleaner than normal but you should realize that busy surfaces are the rule, not the exception. If you are thinking of working on a set of Type Two double eagles and would like my help, please contact me at (214) 675-9897 or by email at dwn@ont.com.